Comprehensive step by step tutorial of building create-read-update-delete CRUD Java web application using Spring Boot, MVC, MongoDB and Angular 5. The main concept of this tutorial is separate backend and frontend. The backend is Spring Boot, Data, and MongoDB, the frontend is Angular 5. We will combine the previous Spring Boot tutorial of building Java REST API. There are the options for using backend framework with Angular 5 front end. First, develop and running backend and Angular 5 on the different port, so the backend side should be CORS enable. Second, wrapping all development and runtime together using the same port. We will use the second option. We assume that you have installed JDK 8, Gradle and Node.js. Now, you have to install Angular CLI. For that, open and edit the terminal or Node.js command line then type this command. Now, you can move to the main steps of the tutorial. As usual, we start creating Spring Boot application by generating the application and its library using Spring Initializer. After go to Spring Initializer using the web browser, create the new application and add the library as below. 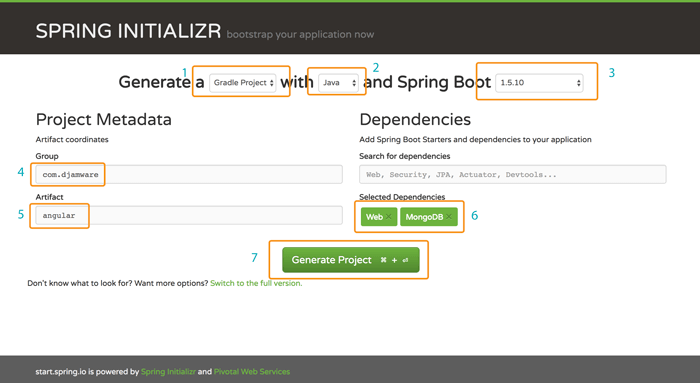 Click `Generate Project` button and the Spring boot application will be downloaded by your browser. Next, extract the zipped Spring Boot project then copy or move to your Java projects folder. To run the Spring Boot application, type this command from the terminal or command line. You will not find a landing page on the browser yet because of there's no frontend or HTML page in the static folder. To connect Spring Boot with MongoDB, open and edit `src/main/java/resources/application.properties` then add this lines. Next, start MongoDB in the other terminal or command line if it's not run yet. Run again Spring Boot application. Now, Spring Boot and MongoDB are connected and ready. If are using Text Editor, you have to create a folder for models. From the terminal create a models folder in `src/main/java/com/djamware/angular`. To create Model or Entity Class simply create a new file at `src/main/java/com/djamware/angular/models` then name it `Contact.java`. Open and edit `src/main/java/com/djamware/angular/models/Contact.java` then add this lines of codes. That class mapped to MongoDB collection with the name `contacts`. For connecting to Contact model, we need to create a Java interface or repository. Create a folder named `repositories` inside `src/main/java/com/djamware/angular/` folder. Next, create a Java Interface file inside that folder. Open and edit `src/main/java/com/djamware/angular/repositories/ContactRepository.java` then add this lines of codes. We only add `findOne` and `delete` method to the interface because the rest method already handled by `CrudRepository` of Spring Data MongoDB. Now, it's a time for RESTful Web Service (REST API) implementation by creating a new RESTful controller file. Create a folder named `controllers` inside `src/main/java/com/djamware/angular/` folder. Create a Java file named `ContactController.java` inside that new folder. Open and edit `src/main/java/com/djamware/angular/controllers/ContactController.java` then add this lines of codes. Now, re-run again Spring Boot application then test the RESTful API. Open another terminal then type this command to get Contact list from the RESTful API. It should display a response like this. To add a contact, type this command to post a contact data. You can check on MongoDB console to verify that new contact data is saved. Next, to get a single contact data by ID type this command. You can test update and delete using these commands. This time for the frontend side, in the terminal and root project folder type this command. That Angular-CLI command will create an Angular 5 application folder named `frontend`. To make Angular 5 build running as Spring Boot frontend, open and edit `frontend/.angular-cli.json` then change `outDir` value as below. Now, test the Angular 5 configuration by type this command. If there's something missing when do `npm install` install the required Node modules that shown in the error message. If everything fine, you can re-start Spring Boot and open the browser then point to `localhost:8080`. You should see this landing page. To create Angular 5 Component, simply run this command inside `frontend` folder. That command will generate all required files for build contact component and also automatically added contact component to app.module.ts. Before add any functionality to the component, we need to add `HttpClientModule` to `app.module.ts`. Open and edit `src/app/app.module.ts` then add this import. Add it to `@NgModule` imports after `BrowserModule`. Next, we will making a request to Contact RESTful API using this Angular 5 `HttpClient` module. Open and edit `frontend/src/app/contact/contact.component.ts` then add this import. Inject `HttpClient` to the constructor. Add array variable for holding contacts data before the constructor. Add a few lines of codes for getting a list of contact data from RESTful API inside `ngOnInit` function. Now, we can display the contact list on the page. Open and edit `frontend/src/app/contact/contact.component.html` then replace all tags with this lines of HTML tags. That HTML tags include style class from Bootstrap CSS library. Open and edit `frontend/src/index.html` then add the Bootstrap CSS and JS library. To use contact component as default landing page, open and edit `frontend/src/app/app.module.ts` the add import for Routing. Create constant router for routing to contact component before `@NgModule`. In @NgModule imports, section adds ROUTES constant, so imports section will be like this. To activate that routes in Angular 5, open and edit `frontend/src/app/app.component.html` then replace all codes with this. Now, we have to test our Spring Boot application displaying contact list using Angular 5. 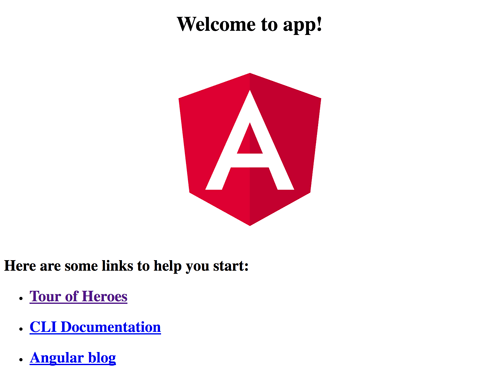 Build Angular 5 application from the frontend folder. Then back to root folder to re-run the Spring Boot application. Refresh the page `localhost:8080` in the browser and you should see this page. Same as previous section, type this command to generate new component. Add router to `frontend/src/app/app.module.ts` routes constant. Open and edit `frontend/src/app/contact-detail/contact-detail.component.ts`. Replace all codes with this. Open and edit `frontend/src/app/contact-detail/contact-detail.component.html`. Replace all codes with this. Open and edit `frontend/src/app/contact/contact.component.html` then replace `Show Detail` text inside `Action` column with this. To create a component to add new Contact, type this command as usual. 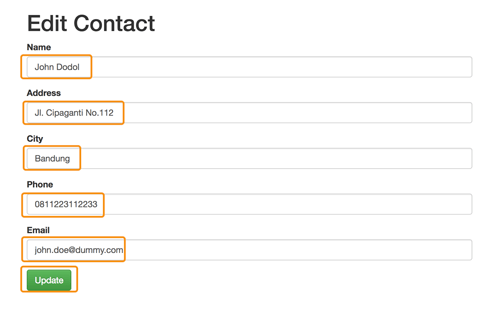 Add 'contact-create' link on `frontend/src/app/contact/contact.component.html`. Now, open and edit `frontend/src/app/contact/contact-create.component.ts` then replace all with this codes. Modify `frontend/src/app/contact-create/contact-create.component.html`, replace all with this HTML tags. 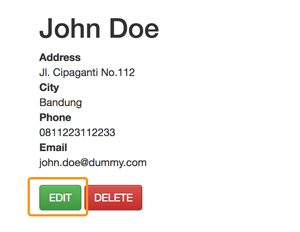 As usual, we will generate component for edit contact. Type this command for doing that. Add route in `frontend/src/app/app.module.ts` so, it looks like this. Open and edit again `frontend/src/app/contact-detail/contact-details.component.html` and add edit `routeLink` in the last line. Now, open and edit `frontend/src/app/contact-edit/contact-edit.component.ts` then replace all codes with this. Open and edit `frontend/src/app/contact-edit/contact-edit.component.html` then replace all codes with this. Open and edit `frontend/src/app/contact-detail/contact-detail`.component.ts then add `Router` module to `@angular/router`. Inject `Router` in the constructor params. Add this function for delete contact. Add delete button in `frontend/src/app/contact-detail/contact-detail.component.html` on the right of Edit `routerLink`. Now, it's time for functionality the whole application. Build the Angular 5 application first. Back to Spring Boot application then run again the application. Here's the Java CRUD web application looks like. That it's for now. If something wrong with the codes in this tutorial, you can compare it with the working full source code in our GitHub.